The Underground Drainage Pipes commonly known as the "Sewer" Pipes, are highly suitable for all underground usages. Available from 4" to 12" diameter, these pipes are laid in the ground as sewer or drainage connection, subsoil drainage for fields, parks and golf courses. They are produced in golden brown colour. 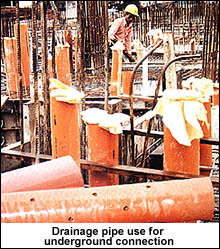 The pipes are joined either by solvent cement welding or integrated rubber ring joint. This allows for soil movement and minor deflection during installation. Perforations on pipes is available on request. Under this range, the 4" pipe is recommended by the telecommunication authorities for use in the ducting of telephone and electrical cables. 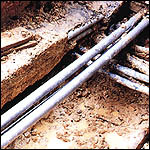 uPVC Pipes are chosen as they provide good protection to the cables and their di-electric properties. In addition, they have the ability to resist corrosion, ease in handling, storage and installation. These pipes are available in grey colour and complete with a separate coupling.